The HP DeskJet 560C printer is an affordable high-quality black and color printer. From the world leader in inkjet printing technology comes the HP DeskJet 560C printer with sharp, clear 600 x 300 dpi black print with Resolution Enhancement technology. Our advanced, easy-to-use HP ColorSmart technology for clear, vivid color output. The HP DeskJet 560C printer has six built-in typefaces and is TrueType font compatible in Windows 3.x. The HP DeskJet 560C printer prints on plain paper, special paper, glossy paper, a wide variety of paper sizes, and up to 20 envelopes or 50 transparencies. The HP DeskJet 560C printer offers a three year limited warranty, the longest in the industry. With exceptional-quality output, renowned HP dependability and durability, and simple set-up operation, its value cannot be beat. This printer has been on our shelves for some time, we can't guarantee full function!! Print Technology Plain Paper drop-on-demand thermal InkJet printing. Will buffer Black DOS Text only. For downloading soft fonts only. Mean Time Between Failure 60,000 page life. Power Module: UL, CSA, TUV, NEMKO, SEMKO, LCIE, SECV, SETI. 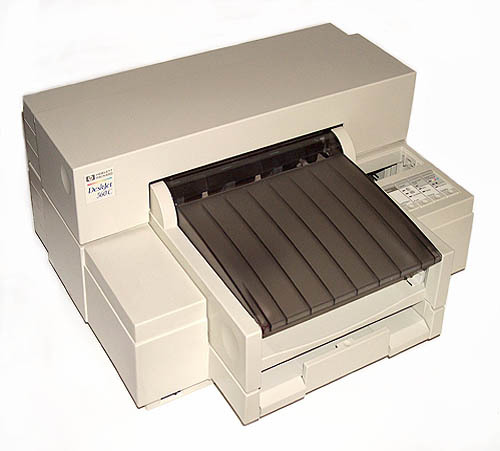 Printer with Power Module: UL, CSA, TUV, ETL EMI. Printer with Power Module FCC Class B when used with a Class B computing device (USA), EMC Directive 89/336/EEC (European Community), VCCI (Japan), SABS (South Africa).